In a digital workplace, the infinite volume of news can be difficult to keep up with. Aggregating important communications into a one-stop destination, creates a place employees can rely on for critical company and industry updates. Purposefully designed to mimic the homepage of popular news websites, the newsroom curates all important information in a format that users are familiar with, making it easy and enjoyable to navigate and consume content. Great news stories can be written and approved using the user-friendly HTML and built-in moderation workflows. Flexibility of distribution is made possible with the robust set of publishing tools including the capability to publish as other people for ghost-written content, schedule future publishing, and push broadcast messages to specific members or groups. 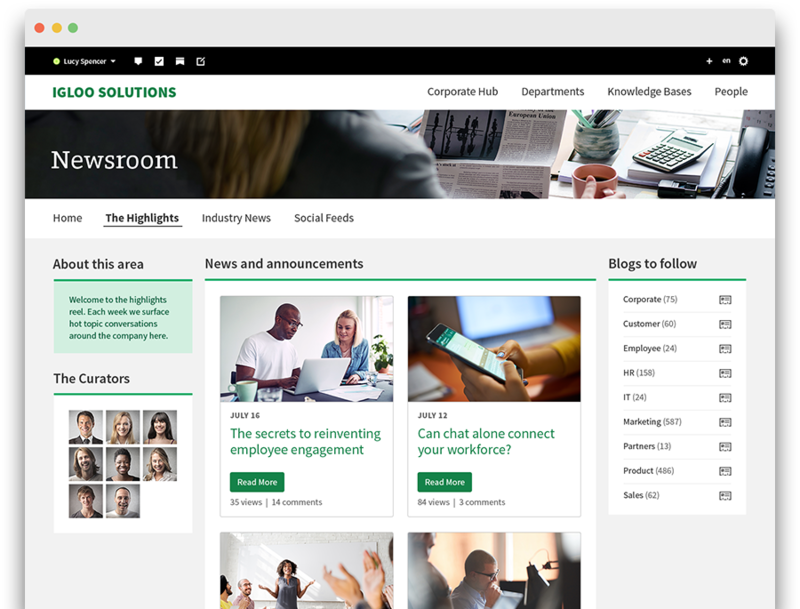 Adding a newsroom to your digital destination reinforces your commitment to frequent and transparent communication with employees and across departments.